Home Automation System | Gravity International W.L.L. Gravity International has become a front-runner in offering the Home Automation Solutions in Qatar that are scalable to any level of homes, apartments, offices, high-rising building, mass and private developments ensuring that all requirements are met within budget wise and time schedules, with optimized system functionality and improving operation efficiency. 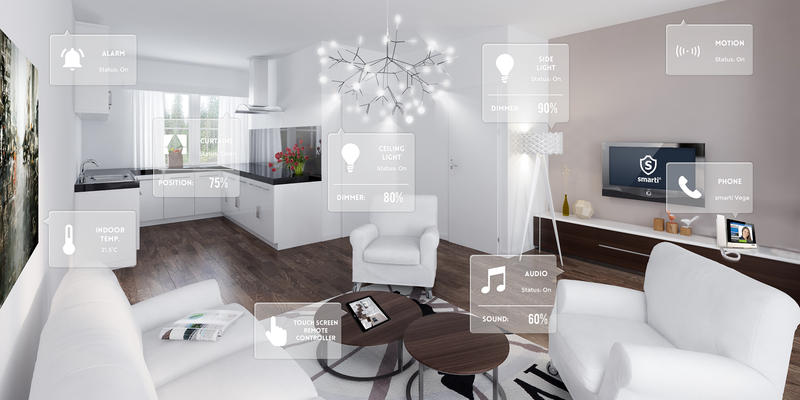 Home Automation enables the automatic control of commonly used elements such as lighting , temperature, music and other home devices in a manner that is personalized to the needs of each family. Automated homes are referred to as “Smart Homes” with comfort, convenience & security. When it comes to your home and your life, you don’t settle for anything but the very best. You want everything to be complete, easy and worry-free. Curtain Control : Control Curtains, Sun blinds, Shutters, Gates . Lighting Control : Switching & Dimming of lights from intelligent Switches. Weather Control : Temperature Control: Heating, Cooling, and Ventilation. With this solution you can easily control everything in your home, room-by-room, using our ultra-cool touch screens and remotes, or anytime, anywhere from your favorite smart device. We are certified EIB KNX partners for Hotel, office and Building automation systems & well experienced in home automation Programming, Testing, and Commissioning and have completed many projects in Qatar. Please Send Your Inquiry Regarding Programming, Testing And Commissioning Home Automation.